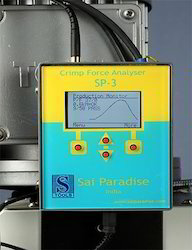 Our range of products include crimp force analyser (sp-3). Unit Size 85 x 103 x 35 mm. In-line sensor enables accurate reading of each crimp produced. clear display shows current info including stored job set-ups and force curve. Installing the force sensor in the Ram of the press reduces false fails in production ans acheives a reduction in waste. The ram encoder eliminates false fails due to main functions affecting press speed. This Filters out all press motor speed changes whist still allowing accurate signature analysis to take place.